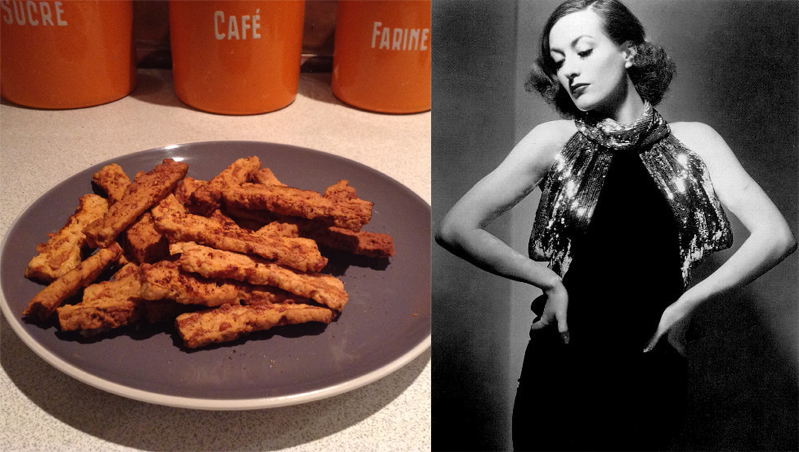 Ever fancied playing host or hostess in old Hollywood style, then Cooking With Joan Crawford, might just give you a few ideas. 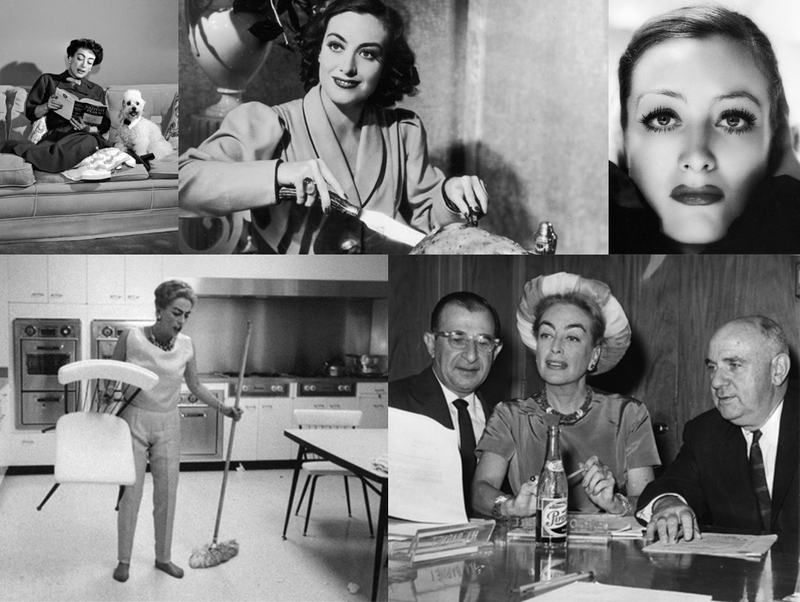 The star of classics like Mildred Pierce and cult fare like Whatever Happened to Baby Jane and Trog may not have won any awards in the mothering department, but Joan Crawford regarded herself as a bit of a domestic goddess in the kitchen, and her dinner parties in the 1930s were the talk of Tinseltown. The proud Texan loved the elaborate and exotic when playing hostess with the most-ess, but out her couture cocktail dresses she preferred her food down home. Jenny Hammerton, who runs the divine Silver Screen Suppers website, which is dedicated to the culinary habits of Hollywood stars of old, has put together over 30 of Crawford’s favourite receipes, including hearty old-fashioned mains like Turkey and Noodles Alfredo and retro desserts like Floating Island, in her new cookbook, with notes about the recipes origination (mainly vintage issues of the film fan magazine Photoplay). I’ve tried out two of the recipes, the Bisquick cheese straws (I made our own Bisquick, but you can get it in Tesco) and the Charcoal Broiled Steak with Roquefort Cheese. Both were delicious and very easy to make. Best served along with a Joan Crawford movie matinee and a hostess trolley full of Cosmos. Just don’t forget the ugli fruit (Joanie’s favourite) or the wire coaters will be out in a flash. 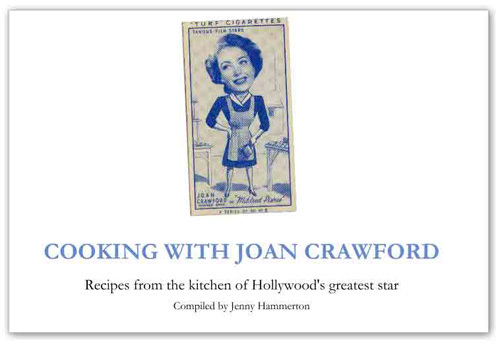 Cooking With Joan Crawford is available exclusively through Blurb (click here) in two versions, one with a swanky hardcover dust jacket with extra titbits about how Joanie liked to entertain, and an image wrap version (sans jacket). 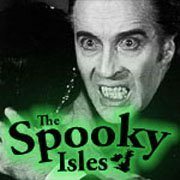 Posted on November 16, 2014, in Books, Cult Film News, Must-See and tagged Books, Cooking With Crawford, Cult Film News, joan crawford, Must See, Silver Screen Suppers. Bookmark the permalink. 1 Comment.